Last night I had the pleasure of eating an insanely large early dinner at Prana in Newton, MA. Prana is located at 292 Centre Street meeting Jefferson Street. It is slightly difficult to park around here, we ended up parking at a meter with a maximum of one hour parking, so we had to go out every so often and fill up the meter. Around 4pm I arrived at the restaurant after having some difficulties with finding parking since its street parking. I thought when I arrived in the restaurant they would kick me out because they close from 4pm to 5pm to get ready for dinner. But I was wrong, they told me it would take a bit longer to have my food ready, and let me order. The hours are a little weird, at least to me, Mon-Fri 11 am – 4 pm, Mon-Sun 5 pm – 8:30 pm and Sat-Sun 10 am – 4 pm. They do serve alcohol, free wifi, it’s family friendly and reservations are accepted (617) 527-7726. There is music playing softly in the background, plenty of seats and space in between tables, the colors in the restaurant are cool and calming. When I was leaving the restaurant they were setting up for dinner, the lit tea lights all around the restaurant and put the lights down just a little. Both settings were beautiful but I was starting to wish we had entered for dinner just because I could see the effort they put into getting the right vibe. It felt comfortable and had a “hang out” vibe. During my visit there I saw plenty of yogis come in after class and grab a smoothie or juice. 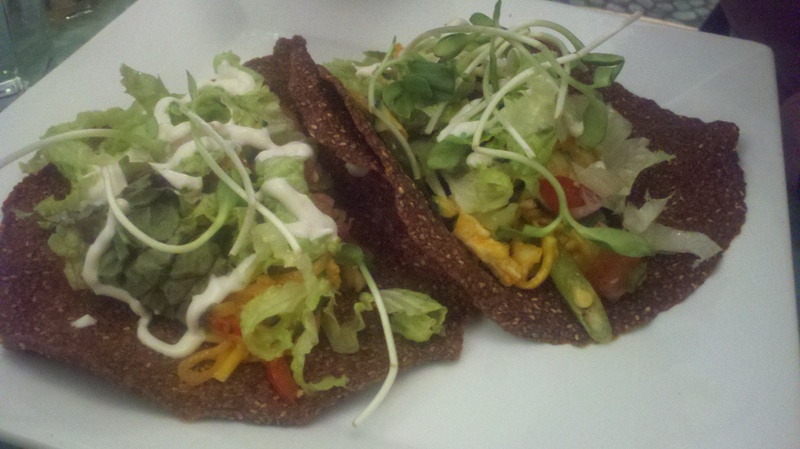 Prana is an all organic, vegan restaurant, and has an almost completely raw menu. They serve breakfast, lunch, dinner, dessert, juices/smoothies and they sell dried fruits, nuts, raw chocolates and other goodies. Check out their menu! I arrived at Prana directly from Vermont and was starving. I went with someone who has had plenty of the raw food I have made but hasn’t been to a restaurant like this before. I was treating them to dinner so we went all out on food! We ordered a small plate raw nachos ($7), raw sushi ($9), raw tacos ($13), small green lemonade ($6.75), raw sundae with one scoop of vanilla nut cream and one scoop of cinnamon pecan nut cream ($10), and raw cheesecake du jour ($9).We also ordered some smoothies to go and a few treats from their goodies shelves. 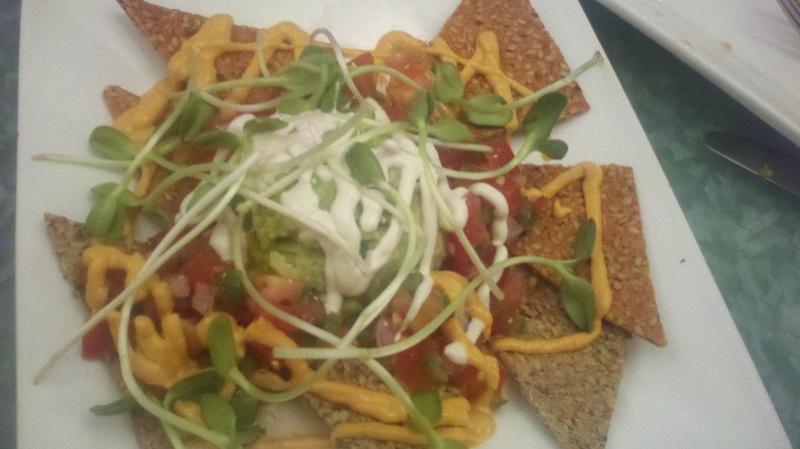 The raw nachos consist of flax and chia chips (made in-house); our plate had a total of six chips. Three were red-orange, spicy, and tasted of tomatoes and the other three were savory (lots of herbs and garlic). If you haven’t had flax crackers before the best way to describe them is; they are crunchy, and the flax seeds are typically held together with pureed vegetables (usually tomatoes, peppers, carrots) and are then dehydrated for a long period of time. There was shredded lettuce, guacamole that tasted very fresh, nut cheese, nut cream, and salsa on top of the nachos. For a garnish pea shoots were spreaded on the plate. We ended up having lots of guacamole left over even though we used forks to cover our chips with the toppings. The nachos are listed as an entrée but for someone with a large appetite like me, this was more of an appetizer. It was delicious and my friend was very pleased as well. This dish has always been something I wished vegan/vegetarian restaurants would have on their menu. It’s something fun, flavorful and easy to make raw or cooked. It was a little bit more difficult for me to figure out everything else to eat though 🙂 so many options for once! 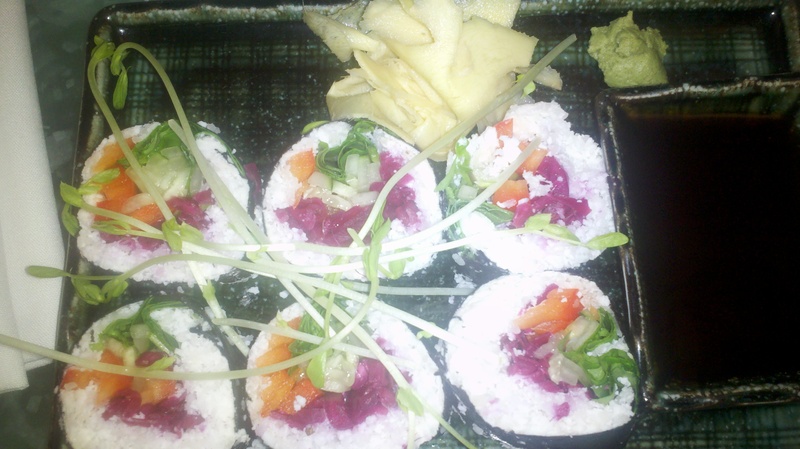 The sushi is wrapped in nori sheets, parsnip rice, and coconut with red cabbage, celery, spinach and red peppers as the filling. Wasabi, aminos, and ginger slices are all on the side. You can choose between avocado or nut cheese in the filling, I was plain and didn’t get either. I ate the sushi with chop sticks and they held together nicely. It wasn’t anymore difficult then eating regular sushi. The vegetables in the center and the parsnips were probably my favorite part. It reminded me of eating sushi with cooked rice. The colors presented in the rolls were pleasing and even looked like sushi with fish in it. For anyone who isn’t use to ordering a raw dish or wants to try one out, the raw tacos from Prana are a great transition dish. The shell is a chia seed wrap that has some great tasting spices and herbs. They hold up amazingly well with all the juices from the salsa and vegetables. The filling is marinated vegetables (the marinade tastes just like the seasonings from a taco kit but much fresher and a little sweet), “sour cream”, guacamole, shredded lettuce, and salsa. The difference between the tacos and nachos are the wrap/chips and the tacos have vegetables. With the tacos we had the seasonal vegetables were yellow squash, zucchini, peppers, pea shoots and just a few string beans. The marinated vegetables are at the very bottom, followed by the “nacho cheese,” salsa, guacamole, lettuce, pea shoots then the sour cream. While consuming all these yummy dishes I had some Green Lemonade (a mix of greens, mostly tasted like spinach and kale, fresh lemon juice and water). The lemonade was good but sorry; the Green Lemonade I make at home is great 😉 I like my Green Lemonade with more lemon; it makes it sweeter and more flavorful. We shared two items for dessert, Raw Cheesecake Du Jour and a Raw Sundae with a scoop of vanilla nut cream and a scoop of cinnamon pecan. 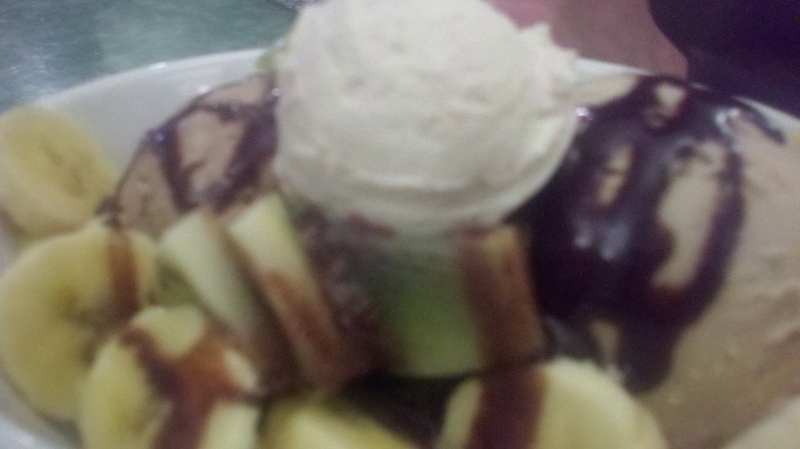 The sundae was drizzled with chocolate and had a few pieces of kiwis and bananas. There was also a little scoop of raw whip cream that was solid but extra creamy when consumed. The ice cream was fantastic! My friend wasn’t too crazy over the cinnamon pecan and was regretting that we didn’t try the ice cream with almond butter cups. The only negatives are this dessert is expensive and the kiwis seemed out of place. They weren’t listed on the menu as being on top of the sundae so I’m going to guess they had to improvise. This dish was another one that amazed my friend on how it was made and how flavorful it ended up being. The texture and “milk”-like smoothness was just like dairy ice cream. 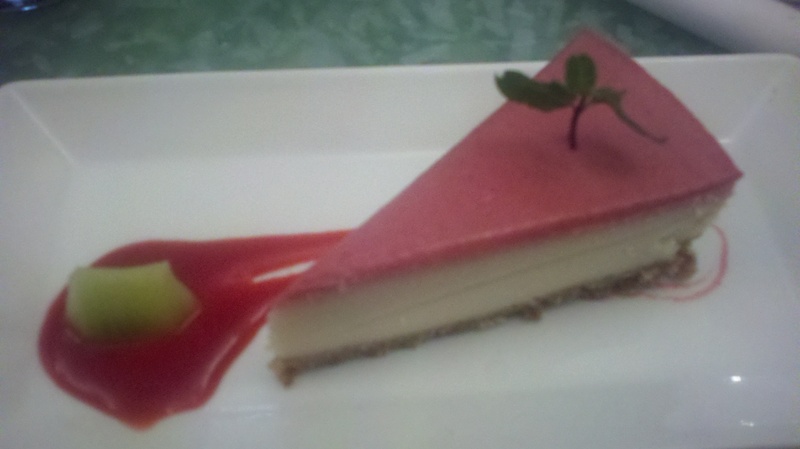 The other dessert we had was the Raw Cheesecake Du Jour, which was a strawberry cheesecake. The cheese was tasteless, wet and didn’t taste sweet or anything. I know it was nut flour filling but it tasted like nothing. The crust was nuts, very thin and also lacked flavor. The only taste was in the strawberry filling top and that was also weak in flavor. As you can see, the cheesecake looks amazing, neat and plated beautifully. So far the best raw cheesecake I have ever had was at Garden Grille a few years back, and sadly they no longer carry that same cheesecake. But the one I had there years ago that still haunts me was strawberry cheesecake. I think I enjoyed the one from Garden Grille so much was because the texture was exactly like a cooked/dairy cheesecake, thick, smooth and creamy. It was also sweet and the crust was even tasty…usually something that doesn’t stick out with raw desserts since they are all pretty much the same (figs, almonds, pecans, agave). Overall I really enjoyed my experience at Prana. Out of 1 to 4, 4 been very expensive and 1 being very cheap I’d give Prana a 3. It is expensive; most raw restaurants are more expensive than just a vegan/vegetarian restaurant. But the process of making these foods are extremely time consuming, and expensive. I picked up an Immune Booster Smoothie for the road and that was so far the most expensive drink I have purchased. The Immune Booster Smoothie consists of: Hibiscus Water, Apple Juice, Shilajit, Strawberries and Ginger. It wasn’t anything special, all I could taste was strawberries and ginger, it still tasted good but I was expecting more flavors. I understand the shilijat and hibiscus are not cheap ingredients and are very difficult to find. But for a 16oz looking drink to cost $9.50 is a bit much. I bought dried jackfruit and daikon chips but I haven’t tested them out yet so I’ll have to keep you all posted on that one! I highly recommend checking out Prana, getting your raw on, and bringing some people you love! I ate so much yesterday that today and yoga I could really feel my buddha belly 😉 of course it was totally worth it. I don’t usually eat that much food or so many transitional foods like coconut wraps. But once in a while it is such a lovely treat.